Isn'tses is a collaboration between visual/electronic artist and musician Lisa McKendrick (Listen Lisse) and animator and electronic artist Tim Drage (Cementimental). The duo perform wearing costumes and masks in conjunction with live video projections and illuminated props. 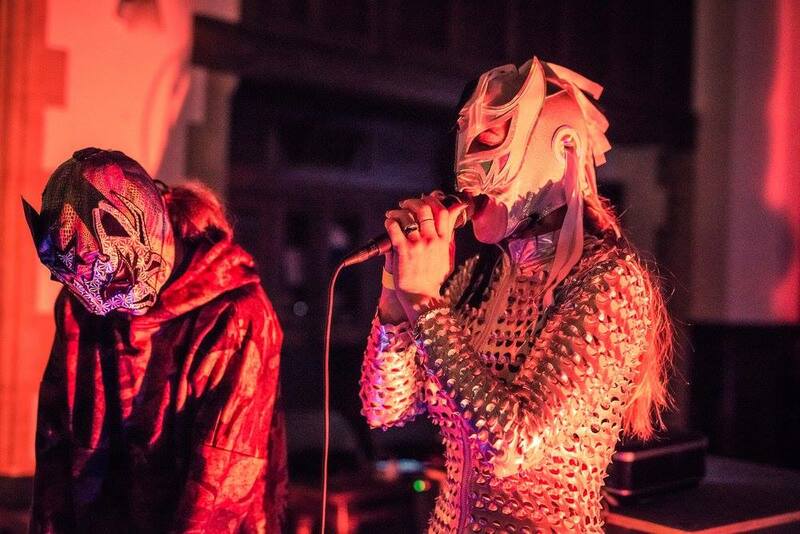 They deliver a spontaneous and improvised performance using theatrical style interaction with their self-built synths, noise boxes, circuit bent toys and vocals. Their music conjures themes such as paganism, freedom of speech, freedom of sound, intergalactic heroism and a playful interpretation of popular culture. The audience often describe the performances as intense and surprising as Isn’tses perform things that even they did not expect to happen. They interact with the space we are in and go with what works at the time, drawing on experiences of previous performances, new material and ideas. Sometimes it’s like an intergalactic war on stage, other times they act out socio-political themes through performance and stage ritual. They like to keep ideas moving and are always working on new techniques and concepts, so rarely play the same set twice as they rework and improvise around recurring elements. Isn'tses want to understand and experience the technology they use rather than simply buy pre-made instruments, so they build circuits from scratch and also use circuit-bending techniques to hack obsolete devices. Their equipment is an electronic collage of circuits that might not be intended to be used together. By building electronics they demystify the magic boxes in the effects chain and create new and unfamiliar noises. Recent gigs include: Fort Process 2018, Liminality (Cacophony, Gallery 46), Festival Bergerie #3, Skronkfest, Modern Panic VIII, Dronica, Woodland Gathering, Liminality (Beyond the Threshold), Baba Yaga's Hut, Bunker Theatre, SOTU Festival Amsterdam, Supernoise and Superperformance Festivals in Denmark. In London the duo appeared at Dronica, Hundred Years Gallery, Café Oto, Gallery 46 and AVDepot2 among others. They played live on Resonance FM (Bermunda Triangle Test Transmission), Cashmere Radio Berlin and their music was played on Graham Dunning’s NTS Radio show “Fractal Meat on a Spongy Bone” and they have featured on the compilations ‘Noisenesia Vs World’, ‘Secret Map ‘and Ladyz in Noyz ‘Rhinocerititis: Voices in Dissent’, and they have released numerous live and studio recordings on their own Bandcamp page and as hand-crafted cassette editions including the studio recording "Punctum" and “Ultimate Problem of Documentation” the album “Attic Sessions” was recorded at Islington Mill, Manchester. A music video of their Woodland Gathering performance was recorded live by Impa TV. Isn’tses from Agata Urbaniak on Vimeo.